At the top, hanging over the eggs a simple 40W bulb. The heat it generates is arround 38° C.
In the middle I've put a water bowl to keep a high relative humidity. 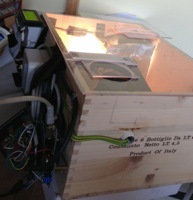 At the bottom right a slowly running 12V fan. I've used a step-down converter (bottom left) which outputs 6V. The Arduino has a running HTTP server which output the sensor values as JSON string. They are being read by another Linux server which generates nice graphs using the RRD tool. On the here shown graph you can see that the water in the bowl evaporated slowly. At 6 o'clock I've filled it up, so the relative humidity increased. and a HD44780 LCD indicating the realtime values. was underdevelopped and did not hatch. 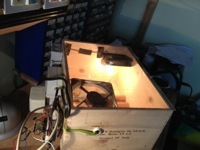 Technically seen I had, during the 21 days the incubator was running, two broken lamps and the Arduino hang once. Let's notice that during the hatch process it is really important to raise the humidity over 75% in order to prevent the not fully hatched chickens to dry out before breaking out of the egg. I moved the water bowls closer to the heat lamps, added two more water dishes and put a big wet sponge inside the incubator. And here it is. 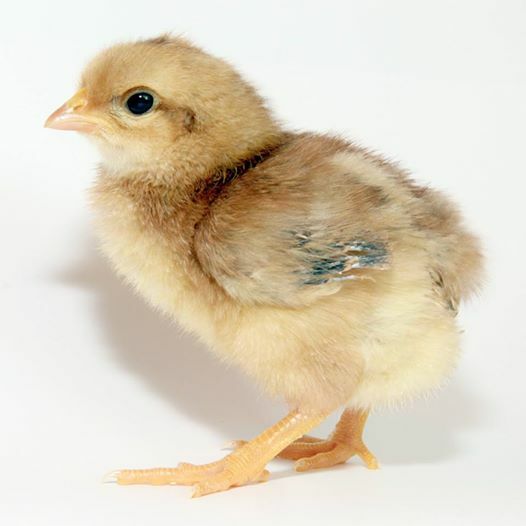 It's name is "Achtchen" (EN: "Number eight") because it's the 8th egg that succeeded in a living little chicken.